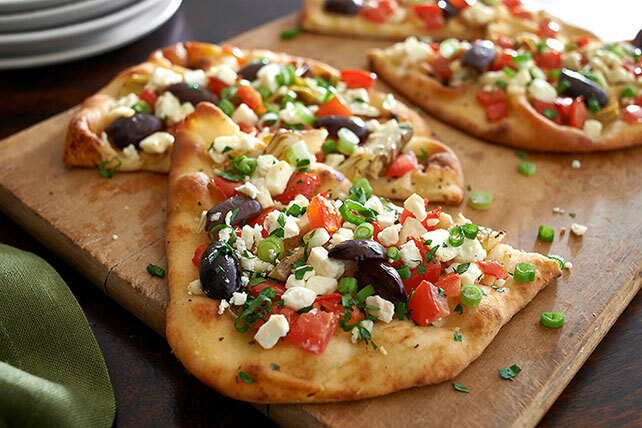 Try this beautiful Greek Flatbread to take your taste buds on a Greek adventure! This Greek Flatbread with Feta cheese can be made in under 30 minutes. Feta is Greek for "piece" or "slice," and refers to an important step in the process of making this delicious cheese. Prepare using ATHENOS Crumbled Feta Cheese with Basil & Tomato. Prepare using 4 thin oblong flatbreads (3 oz. each), 4 round pita breads (about 2 oz. each) or 2 halved round naan breads (3 oz. each).